Real Madrid have been linked with Eden Hazard for a long time now and the player himself has said numerous times that he wants to join the Galacticos. However, according to Marca, that may not happen after all as the Galacticos are no longer that keen on signing the Belgian. 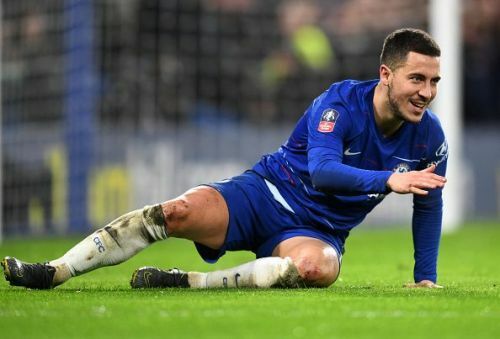 Chelsea have been hit with a ban on signing players for the next two transfer window, making it harder to let go Eden Hazard in the summer transfer window of 2019. However, in what could be great news for the Blues, they might not have to come down to that as the Galacticos aren’t entirely hell-bent on bringing the Chelsea star to the Santiago Bernabeu. The report claims that the Merengues think that their left-wing position is covered by Vinicius Jr., who has been exceptional so far this season, and the imminent arrival of another Brazilian super-talent Rodrygo. Marco Asensio, too, can play in that position and the Blancos are, as a result, in no hurry to make a decision. The report adds that they will only make a decision on the Belgian captain in June. Marca are a Madrid-based paper and might have some inside information on the Galacticos. This report also makes sense from angles as both Vinicius and Rodrygo are left-inside forwards and with Hazard joining Madrid, the Galacticos would have three players for one position. Right now, the Blues are in a bit of a quandary. Not only are they playing badly, but they have also been hit with a transfer ban. All things considered, it is going to be an uphill battle from here for the Londoners.